Karu Jayasuriya breaks his silence over political crisis. Slated for today, Parliament’s re-opening has been postponed by another week. Activists suspect former dictator Rajapaksa is trying to buy opposition votes. 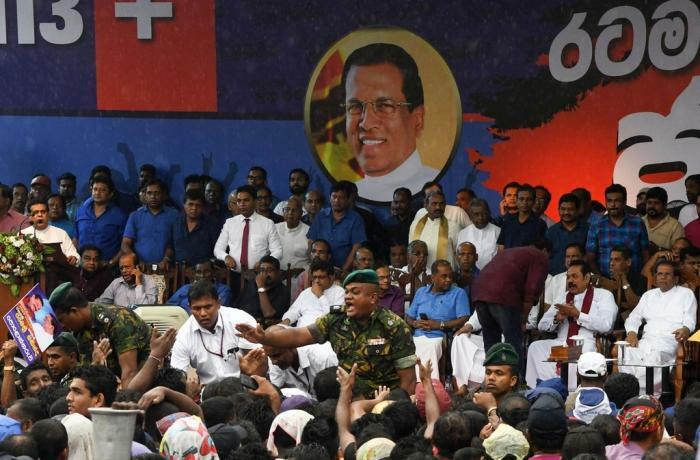 Colombo (AsiaNews) – After days of silence Karu Jayasuriya, the speaker of Sri Lanka’s Parliament, spoke about the country’s political crisis and its two prime ministers. “I consider it my paramount duty to act in accordance with my conscience for the protection of rights and privileges of the majority of the members of Parliament” and prevent “the destruction of democracy that we have safeguarded up to now,” Mr Jayasuriya said. The speaker has decided to maintain the status quo in Parliament before it was prorogued. The house was supposed to reconvene today, but is now expected back in session on 14 November, unless it is further delayed. A week from now, either claimant to the prime minister chair will have to obtain the confidence of the house. The two rivals are Ranil Wickremasinghe, who was dismissed by President Maithripala Sirisena even though he is one of his allies, and Sirisena’s new pick, former dictator Mahinda Rajapaksa, who has been accused of human rights abuses related to the country’s civil war. Sirisena was elected in 2015 against Rajapaksa. "[T]he majority is of the opinion that all changes made in the Parliament are undemocratic and inconsistent with traditions of Parliament,” Speaker Jayasuriya said. “I wish to emphasize that I am compelled to accept the status that existed previously until such time that they and the new political alliance prove their majority in Parliament,” he added. Speaker Jayasuriya was presented with a motion signed by 116 deputies out of a total of 225 indicating their opposition to the president’s decision. Outside of parliament, many activists fear that the continued prorogation of Parliament will help the former dictator to "buy" the necessary opposition votes to be voted in. In light of this danger, lawmaker Range Bandara released an audio recording in which Rajapaksa is heard offering bribes in exchange for votes.